The Island pace is slow, friendly and relaxed with plenty to do and see throughout the year. Youll find farms raising exotic animals, theater programs, festivals and fairs throughout the season. Browse our shops offering distinctive Washington Island products. You can come for the day or choose from one of our scenic motels, inns, bed & breakfast, or cottages for your relaxing longer stay. Washington Island is a great place for the nature lover who wants to bicycle, swim, golf, fish, horseback ride and sightsee. You can kayak or canoe our picturesque harbors and shorelines. Hike, cross-country ski, snowshoe or simply do some bird watching. Make a point of taking in the Jacobsen Museum at Little Lake, just one of several museums located on the island. 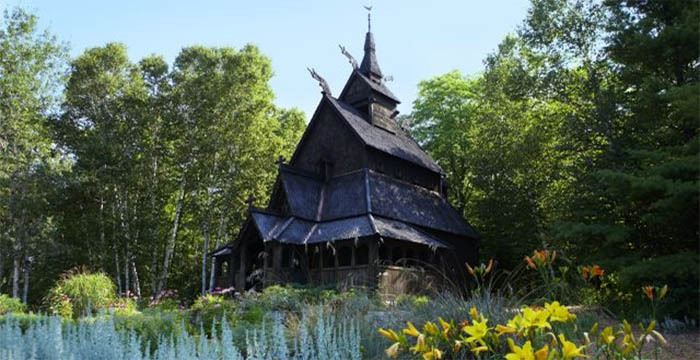 Stop by the Norwegian stavkirke (stav church). 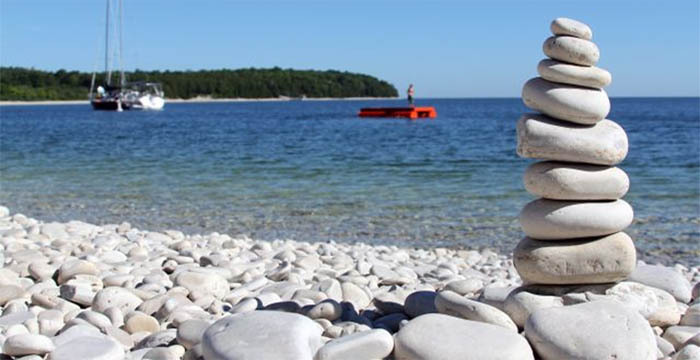 Feel the incredibly smooth pebbles at Schoolhouse beach. Come for the fall colors and the famous Door County fish boils. Bikes can be rented from various locations on the island. You can also rent electric cars or mopeds at the ferry terminal area for touring the island. First-time visitors can get an entertaining overview of the island's points of scenic and historic interest by taking a narrated ride on an open-air tram or explore our island on your own. Afterward, treat yourself to a delicious meal at one of our fine restaurants or stop in at the local grocery store and pack a picnic lunch for one of the parks or our pristine beaches. Crossing "Death's Door" to Washington Island is a trip through time. The six-mile stretch of water that separates the peninsula from Washington Island traverses the tricky currents and shifting winds that used to swamp many a canoe, prompting early Native American inhabitants to call it Death's Door. French explorers picked up on the name and, chastened by the difficulties experienced by their schooners, translated the Indian name for the strait to Porte des Morte. That name still exists on the nautical charts and eventually gave birth to the county's name. But passage today is a safe, 30-minute crossing with or without a vehicle on the year-round car ferry at Northport. 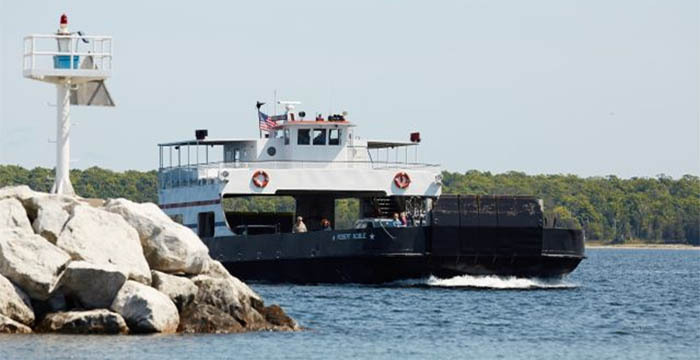 Or passengers without vehicles can take a narrated boat excursion from Gills Rock. 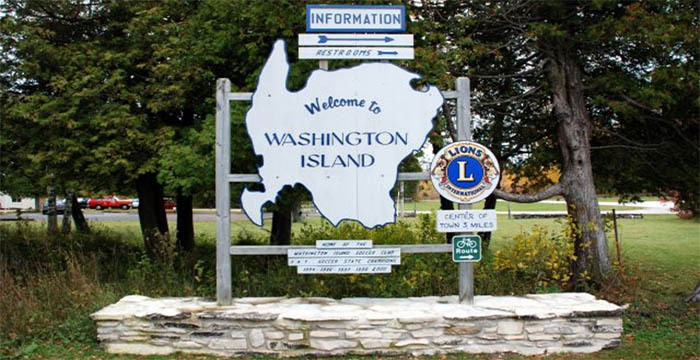 For more information on Washington Island, call (920) 847-2179 or visit our website: www.WashingtonIslandChamber.com. When arriving at Northport the employees with red vests will be happy to assist you with ticket sales and ferry information while the employees with the royal blue vests will be able to assist you with island & other Door County information. Remember, once on the island you can always stop at our Welcome Center, located just past the Ferry Terminal, for additional information. Rock Island, just a few miles off the northeast tip of Washington Island, makes a great side trip and can be reached by passenger ferry out of Jackson Harbor from late May into October. The natural beauty of Rock Island is preserved because only foot traffic is allowed. Stop in and tour the historic stone boathouse and explore the oldest lighthouse in the region. There are a limited number of backpack campsites but no other overnight lodging. For more information on Rock Island State Park, call (920) 847-2235 or when arriving at Northport the employees with the royal blue vests will be able to assist you.